The Ultimate Short Throw series provides high performance projection in small spaces. 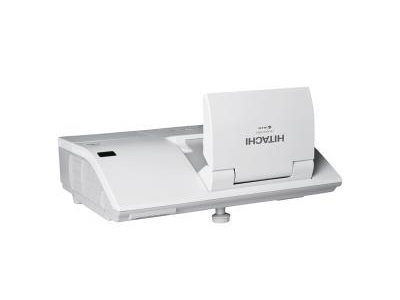 By integrating Hitachi StarBoard™ software with advanced projector technology the CP-AW3019WNM can deliver the complete interactive experience on any flat surface. The compact lightweight chassis and optional wireless capability makes this projector easy to install and flexible to use. With the bundled wall-mount and optional tabletop kit you can project onto any existing whiteboard wall or tabletop. ImageCare - is the technology that regulates lamp power combing optimal picture performance with maximum energy savings. Wireless Networking - Wireless networking offers quick easy and secure network access. Browser based software provides easy management control and monitoring of networked projectors.